Basic ingredients: The team at the Welsh Cookery School of Artisan Food is on a “real food” journey that introduces students to experts in beer, cheese, baking, fishing, butchery and more besides. Described as a “moveable feast”, the school’s tasty tours could see them destined for producers’ premises, country houses and gardens or simply the stunning scenery of the current venue, Brecon Beacons-based Myddfai Community Hall and Visitor Centre. School founder and director, Margaret Rees, is a published author and TV presenter and has won awards for her restaurant, The Cobblers in Llandybie. Half-day taster courses are generally £45 and include Real Breadmaking, Celtic Feasts and Festivals and a Chalet Management and Cooking Course. Masterclasses are hosted by notable guests, such as Italian food specialist Valentina Harris, and Scott Davies, founder of the highly lauded food producers, Cnwd. 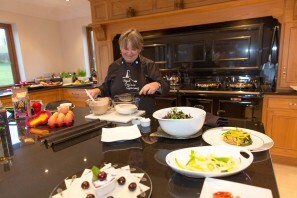 Regular events include Wild Garlic Foraging, cheesemaking days and lunch clubs. They say: What makes us unique is our range. Whether you’re an independent traveller looking for a one-day bespoke cooking course, or a catering professional looking to develop a new food tourism business, we’re here to help you plan your journey into the brand-new world of old-fashioned food. We say: A slightly different experience for those who enjoy “travelling with food in mind”, the school’s food trails are an intriguing option: three day explorations encompassing local food producers and cultural landmarks. The Teify Valley Food Trail takes in fisheries, smokeries, cheesemakers and breweries and the Dylan Thomas Centenary Food and Culture Trail follows in the Welsh poet’s footsteps along his favourite walks and hostelries.